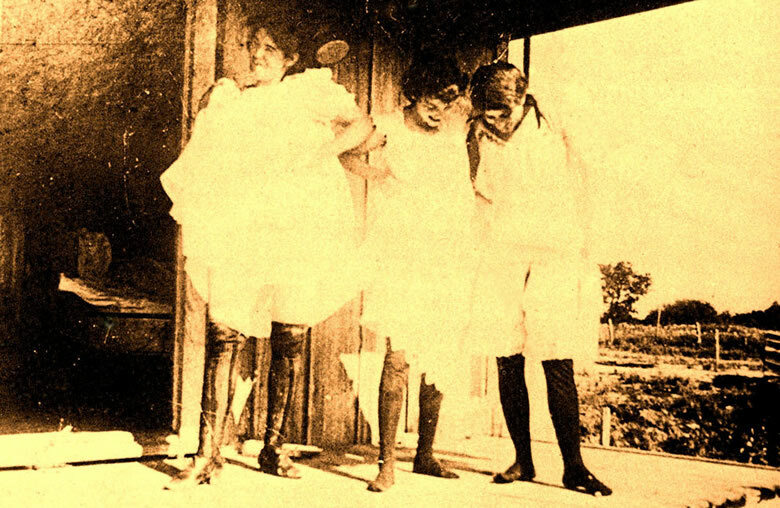 Prostitutes, such as these in Caldwell County south of Austin, operated from a variety of venues during Guy Town's heyday in Austin. While some women lived in comfortable, two-story bordellos, many more operated from run-down, one-room shacks such as the one pictured here. Photo courtesy of Larry Jones. On one block, archeologists uncovered the detached kitchen in what had been the Susan Morgan boarding house. Among the fairly dense array of artifacts strewn across its dirt floor, investigators found a small ash pit containing a cache of ammunition and sewing supplies. Privies were often placed along the back of property lots, near alleyways. In Austin, unlike larger cities such as San Antonio or Houston that had strict sanitation ordinances, most privies were shallow, unlined, and foul-smelling affairs that required frequent clean-out, or replacement. 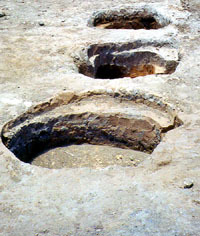 Here, a line of shallow, excavated privies is shown. These privies served the residents at the Susan Morgan boarding house. Artifacts from a privy located behind the site of a tenement building on the City Hall block. 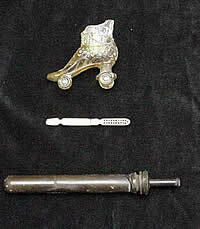 From top to bottom, a decorative glass roller skate, a bone make-up brush, and a syringe. Photo courtesy Hicks & Co. This 1898 dog tag was found next to a brick foundation pier from a small rental house. In 1896, the house was occupied by two Black women. In 1905, the house was a saloon operated by Candido Dellana. In 1876, the Austin Daily Statesman reported that two women arrested for keeping a brothel had threatened to divulge who their frequent clients were. The article playfully added that "several high-toned gentlemen [were] quaking in their boots." The women were denizens of Austin's Guy Town, the infamous red-light district that blossomed during the last quarter of the nineteenth century. Their clients were city council members, legislators, and businessmen who tacitly supported business in Guy Town through their continued patronage. Their stories unfold along with those of others who helped build Austin in the nineteenth and twentieth centuries. The saga of Guy Town is the story of Tom Callahan, a rowdy young police officer in 1884 who became involved with a prostitute and found himself on the wrong side of the law one too many times. It is the story of Mollie King, a dishonored woman in her twenties who struggled to live down the shame of an out-of-wedlock child. The end to that struggle came one spring morning in 1912, when she was murdered by her lover behind the Piper Saloon. It is the story of a former slave named Caroline Robinson, who purchased property in 1867 along Second Street where she lived quietly with her white lover and their child. And it is also the story of the enterprising Schneider family, the saloon-owning Metz clan, the Italian immigrant Cuneo family, and the debt-riddled Bozeths. Indeed, between 1876 and 1913, the neighborhood known as Guy Town served as the backdrop for countless human dramas involving not just prostitutes, gamblers, and drinkers, but laundresses, housekeepers, lawyers, engineers, junk dealers, blacksmiths, masons, and saloon porters. All of these formed the small First Ward community located near the river, just west of Congress Avenue; today this area has given way to high-rise office buildings and apartments. Hicks & Company has been conducting archeological investigations of Guy Town as part of Austin's downtown redevelopment initiative. Excavations have spanned four city blocks, including the block where the city plans to build its new city hall. Integrating detailed historical research with archeological investigations, the project has provided unique insights not only into one of the more notorious aspects of the city's past, but also into a residential neighborhood peopled by an ethnically and economically diverse population. Investigations have uncovered over 100 features pertaining to both businesses and residences in the project area. Types of features include foundations, wells, cisterns, privies, trash pits, and yardscape features. These features were built and shared by a dynamic community of individuals whose ethnic and economic backgrounds were as diverse as their various trades. In an on-site lab, archeologists processed more than 10,000 artifacts representing not only the business of Guy Town but also the everyday lives of hundreds of residents who made this neighborhood their home. The personal effects they left behind serve as a compelling document of their unwritten history. 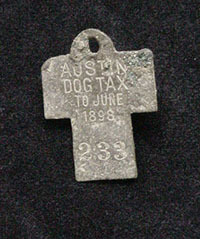 A dog license from 1898 is a poignant reminder of a long-lost pet; an axe head and a tatting needle illustrate the type of daily work performed by one-time residents; a spur recalls the mythic cattle ranching industry; broken and discarded toys attest to the sorts of games children played; and a conch shell, perhaps a memento from a trip to the sea, gives us a sense of someone's decorative aesthetic. Alongside these more-mundane symbols of everyday life lie the artifacts of red light activities and the business of Guy Towndevices used for women's birth control, fancy cut-glass goblets, bar tokens, dice, and hundreds of empty beer, wine, and whisky bottles. Ongoing research and analysis will continue to bring the Guy Town community into focus and, in the process, create a fascinating collage of a nineteenth-century urban neighborhood. The Guy Town webpage was written by Rachel Feit, staff archeologist with Hicks & Company of Austin, Texas. More detailed information on the Guy Town excavations and analyses is available on the Hicks & Company website. Guy Town was Austin's infamous red-light district that flourished in the downtown area during the last quarter of the nineteenth century. The Bozeth Cistern. Located next to the front entrance of the house, the cistern was likely covered by a front porch. Water from the roof of the house was collected through a pipe that ran into the opening on top of the cistern. An overflow spout directed excess water into the yard. Photo courtesy Hicks & Co. 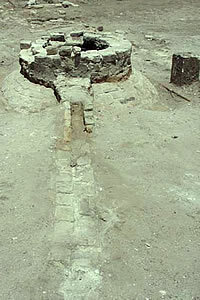 Brick foundation for the Bozeth House, located on the corner of San Antonio and Second Street. The Bozeth family worked as brick masons and occupied this house for close to seventy years. 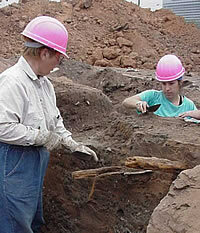 Archeologists from Hicks & Co. excavate a privy. 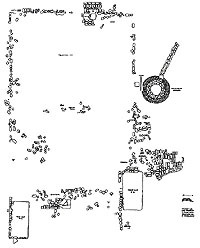 The odd, many-cornered shape of this pit suggests that the privy shaft was moved around a number of times before it was finally covered over. Photo courtesy Hicks & Co.